GLACIER NATIONAL PARK, Mont. - If a stiff wind is blowing, take a trip to the basement of Many Glacier Hotel. The creaking timbers and groaning infrastructure remind one of an old sailing ship - one that has seen a few too many storms. Many Glacier was one of the flagships in a plan by Great Northern Railway magnate Louis W. Hill to expand tourism in the park, which was created in 1910. The railroad built two grand log hotels not long after the park's creation, along with a network of roads and backcountry chalets. Hill's dreams never came fully to fruition. Straddling the Continental Divide in northernmost Montana, Glacier is beset by grueling winters. Each spring, park employees dynamite house-sized snowdrifts to clear Going-to-the-Sun Highway, one of the park's greatest attractions. What passes for summer is short, and compared to parks such as Yellowstone and Yosemite, Glacier sees relatively few visitors - 1.6 million last year, down from 2.2 million in the mid-'90s. Meanwhile, Many Glacier and several other hotels are crumbling. The old lodges have never had a major overhaul, mainly because neither the National Park Service, which now holds title to the hotels, nor the company that manages them, has been willing to foot the expense. This spring, Rep. Rick Hill and Sen. Conrad Burns, both Montana Republicans, introduced legislation that would help raise money to renovate the hotels. The proposals ran into immediate opposition from the National Parks Conservation Association and other critics, because some provisions undermine concessionaire reforms approved by Congress just two years ago. These critics say the legislation, which has been stripped down in recent weeks, is a sweetheart deal for private business in a national park. 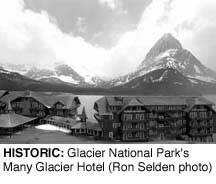 Glacier's hotels have been managed for 40 years by Glacier Park Inc. (GPI), which holds the the largest of eight concession contracts in Glacier for food, drinks, souvenirs, tours and transportation services. GPI runs six hotels and lodges in and around the park. But it says current Park Service rules don't allow it to earn enough money to fund needed renovations. Those rules, tightened by Congress in 1998, limit concessionaire contracts to 10 years, although 20-year terms may be negotiated in some cases. The shorter contracts make investing in the facilities risky, says GPI president Dale Scott. "It's very difficult to talk to a banker about a 10-year mortgage," he says, adding that GPI is willing to "put up what is necessary" to renovate the hotels, provided the company is allowed to increase revenues to cover the costs. The current contract with the Park Service, negotiated in 1981 and due to expire in 2005, also limits GPI's operating season to three and a half months. Scott says he would like to expand both the season and the hotels to accommodate conferences and meetings. "You go after group activities on the shoulder," Scott says, which in Glacier means the late spring and early fall. "We need to develop things that educate and entertain while promoting the park's values." Hill and Burns say Glacier's situation is unique, and that their measure gives park managers more options for fixing the hotels, which could cost up to $100 million. Their plan could allow the concessionaire to sign longer contracts with the park, expand some buildings and charge more for rooms. Along with opening the doors for private financing, their bill could also extend the park's commercial operating season to six months and give the park's main concessionaire a 40-year contract. Critics say Hill and Burns want to usher the Park Service back to the days when concessionaires were guaranteed contracts and gave a pittance of their profits back to the parks. "This bill is designed and crafted by GPI to maintain its anchor in the park on its own terms," National Parks Conservation Association regional director Tony Jewett said when the proposal was first introduced. "GPI shouldn't be dictating the terms." In June, Sen. Max Baucus, D-Mont., unveiled competing legislation that would finance park hotel and infrastructure repairs while leaving existing concession laws intact. Instead of extending concession contracts, the bill calls for setting up "historic lease financing" that would enable hotel operators to qualify for federal tax credits while repairs are being made. Leases could extend 40-50 years, but the length of the commercial season would not be changed. "We're trying to find a balance between public and private investment that works for the public," Baucus legislative director Brian Kuehl explained. Faced with growing opposition, Hill was forced to backpedal this summer as he, Baucus and Burns were unable to hold a fragile compromise together. A slimmed-down version of Hill's legislation, which now calls on the Park Service to develop its own hotel-repair proposals by the end of next year, was approved by the House Resources Committee in late July. "Unfortunately, Sen. Baucus' bill destroyed that delicate compromise and polarized the issue," charged Hill. "It basically boils down to the position that environmentalists oppose private investment in national park facilities." While both Hill and Baucus have claimed Park Service support, it is unclear where the agency now stands. Negotiations among Montana's congressional delegation continue. The author writes from Helena, Montana. Glacier Park Inc. at 1850 N. Central Ave., Phoenix, AZ 85077-0925 (406/226-5632 or 602/207-2616).